You scream out as you hit the ground hard. The earth is shaking so viciously that you can’t regain your footing. In a split second, you begin to plummet down below the once-solid ground you stood upon moments ago. A maw full of rows of pointed teeth greets you as you are swallowed whole. A wurm has unearthed itself and you are its dinner! I’ve been eyeing the wurm’s statblock for quite some time. When I first glanced at it, I’d assumed that it was a reskin of a purple worm. I mean, D&D already has a giant, tunneling behemoth. Why reinvent the wheel? I was very wrong. The wurm is a creature that is specifically created with a goal in mind; to absolutely demolish a city block in the blink of an eye. By the gods it does this job well. But with those same abilities, they’re also is able to devour and decimate a party of unsuspecting adventurers. 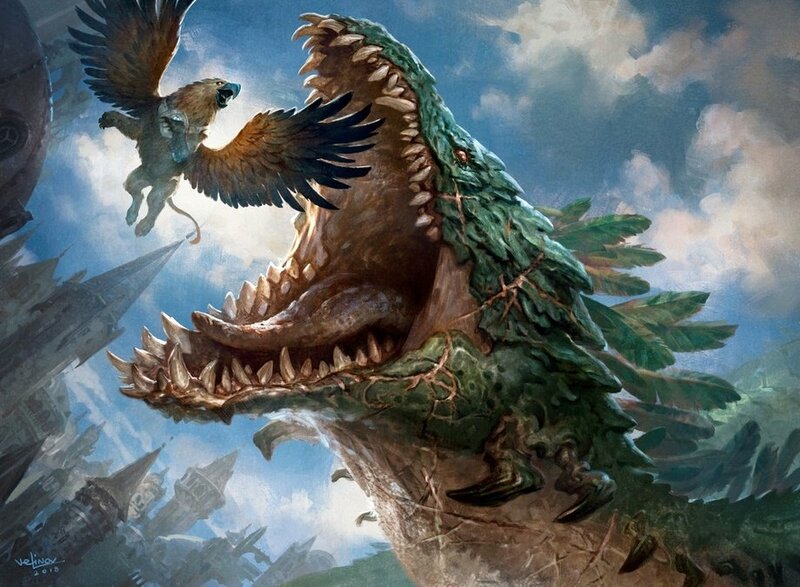 While this is only the second creature in Guildmasters’ Guide to Ravnica (GGtR) that I’ve done a deep-dive on, it seems like WotC has gotten a lot more bold with their creature design. These creatures feel deadlier than creatures of a similar CR in their other books. I mean, just look at the battleforce angel! The wurm is no exception to this rule. In fact, I’d be so bold as to say I like their design more than the purple worm’s. They are way more destructive, have a higher multi-target damage potential, but at 1 whole CR lower. If it’s a city you want to be leveled or an adventuring party you want to be eaten, the wurm is just the creature for the job. There’s not a ton of official lore alongside the wurm’s statblock in GGtR. They’re very much a creature that can be taken at face value. For me, this lack of detailed lore is a bonus. I’m not a Magic: the Gathering fan in the slightest so having a creature that’s able to be plopped into any D&D game is awesome. Wurms are essentially enormous creatures that look similar to a limbless, wingless dragon. These worm-like creatures tunnel through the earth and will consume anything and everything that they cross paths with. People, animals, plants, trees, buildings, you name it, a wurm has eaten it. GGtR has the best artwork out of the core books. Don’t @ me. Credit: WotC. However, wurms don’t just tunnel through the ground. They emit sonic vibrations that actually liquify the earth in front of and around it. Wurms actually swim through the earth! They can even do this to solid stone, though it takes much more effort to do so. Jerks, like the Gruul Clans, like to lead wurms towards cities they want to see demolished. As you can imagine, it’s very effective. You can find the statblock for the wurm on page 225 of GGtR. Speed: 50 ft., burrow 30 ft. This array of ability scores should surprise absolutely no one. A wurm is not an intelligent creature, wurms cannot even speak a language. It’s a beast, but an enormous and powerful one at that. They have fantastic Strength and Consitution modifiers at +7 and +6 respectively. This positions them as a powerful damage dealer and a hardy creature that has a great chance of making Consitution saving throws. CON saves are one of the most popular saving throws in 5e so this is a great bonus to have. Their Wisdom and Dexterity modifiers are average. This isn’t great as they’re two of the most frequently used saving throws ability scores in 5e. However, they do have proficiency in Wisdom saving throws so this low stat allocation isn’t terrible. One mediocre saving throw stat isn’t the end of the world. These are enormous creatures, meaning that there are plenty of spots to hit them. If you’re using flanking rules they become even easier to attack. That being said, due to their tough natural armor with an AC 18 they are still quite difficult to attack. A health pool of 200 HP gives the wurm plenty off a buffer to wreak some havoc and carnage in an encounter. They have excellent mixed movement speed with a base speed of 50 ft., plus they can even burrow themselves in soft earth for up to 30 ft. of that. That’s some solid mobility that’s well above the average PC’s capabilities. As I mentioned before, wurms have proficiency in two of the most frequently used saving throws in the game. Both of these will serve the wurm well in combat. Their offenses require them to move constantly throughout the battlefield for maximum damage output. Being crowd controlled isn’t an option. Wurms do not have sight. However, their biology allows them to still perceive the world directly around them. In fact, they can sense anything within 60 ft. of them thanks to their blindsight. They can even sense creatures within 60 ft. of them while they are underground due to their tremorsense. Tremorsense essentially allows a wurm or other creature to use vibrations in the earth to find the location of a creature that’s currently in contact with the ground. This is great, but if the wurm’s enemies can find a way to not make contact with the ground while the wurm is burrowed, the wurm is essentially blind until it surfaces. Blindsight so accurate they can chomp birds right out of the sky! Credit: WotC. Earth Tremors. The wurm creates earth tremors as it moves overland or underground. Any creature that comes within 30 feet of the moving wurm for the first time on a turn must succeed on a DC 20 Dexterity saving throw or take 10 (3d6) bludgeoning damage and fall prone. Any structure or object anchored to the ground that comes within 30 feet of the moving wurm for the first time on a turn takes 10 (3d6) force damage. Siege Monster. The wurm deals double damage to objects and structures. Tunneler. The wurm can burrow through solid rock at half its burrow speed and leaves a 10-foot-diameter tunnel in its wake. Earth Tremors is a very cool ability and reminds me a lot of the phoenix’s Fire Form trait. Essentially, when the wurm moves around either underground or on solid ground it causes a creature within 30 ft. of it to make a Dexterity saving throw or take bludgeoning damage. This can only happen once per turn. The downside to Earth Tremors is that it’s an “all or nothing” type of ability. If a creature makes the saving throw, they don’t take any damage. However, it’s a high saving throw so it’s certain to deal some guaranteed chip damage each round. Regardless, it does some solid force damage to structures automatically. Speaking of damaging structures, wurms are also a Siege Monster. This means that any damage they deal to objects or structures is doubled. So that 3d6 force damage from Earth Tremors is now basically 6d6 force damage. A wurm will make quick work of a city if left unchecked. Tunneler gives wurms a bit of extra survivability in case they are trapped in an area without dirt or loose earth. Most creatures with burrow speed can’t dig through solid rock or stone, but wurms can! However, burrowing in this way means they move at half their burrow speed. Bite. Melee Weapon Attack: +12 to hit, reach 10 ft., one target. Hit: 24 (5d6 +7) piercing damage. If the target is a Medium or smaller creature, it must succeed on a DC 20 Dexterity saving throw or be swallowed by the wurm. 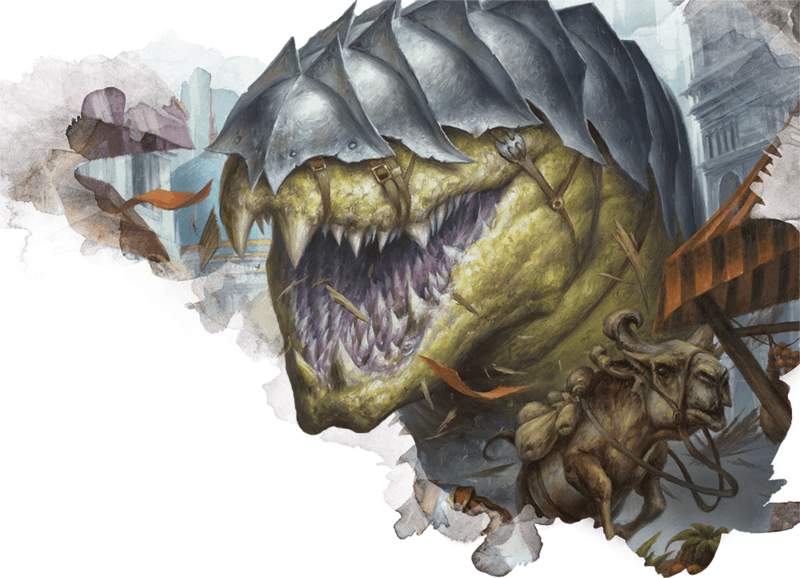 A swallowed creature is blinded and restrained, and has total cover against attacks and other effects outside the wurm, and takes 17 (5d6) acid damage at the start of each of the wurm’s turns. 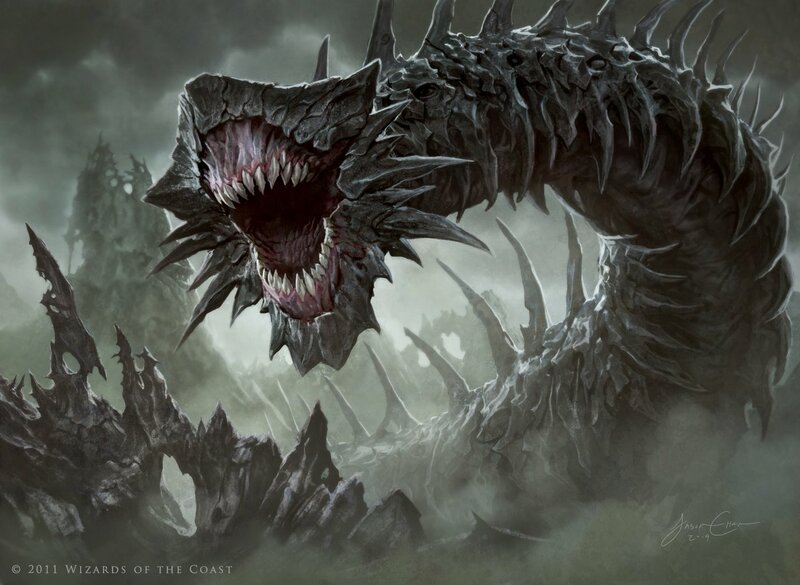 If the wurm takes 30 damage or more on a single turn from a creature inside it, the wurm must succeed on a DC 21 Constitution saving throw at the end of that turn or regurgitate all swallowed creatures, which fall prone in a space within 10 feet of the wurm. If the wurm dies, a swallowed creature is no longer restrained by it and can escape from the corpse by using 20 feet of movement, exiting prone. I apologize for the wall of text with this Bite, but I have no control over such things. Seriously, there’s a lot going on in just a single action. For starters, this is a bite attack with 10 ft. of reach. Remember, wurms are a huge sized creature. They have an enormous range of attack. +12 to hit is excellent, but it needs to be. They only get one shot at making their attack per turn. Every attack needs to count. Wurms have to be one of the few high CR creatures that don’t have a form of Multiattack. This is certainly concerning, but they at least can deal some solid passive damage with Earth Tremors to make up for this. They also can deal some additional passive damage if creatures they’ve bitten fail their DC 20 Dexterity saving throw to avoid being swallowed. If they are swallowed they will begin their turn by taking an average of 17 acid damage. They can only get out if they can deal 30 damage in a single turn while inside. That’s going to be difficult considering the fact that they’re blinded and restrained. With one attack per turn, the wurm has a very poor action economy. They’re not able to rely on their Bite to do all the work for them as a traditional creature would. Instead, wurms are more of a slow burn type of creature. They are reliant on their enemies not being able to regularly make the DC 20 Dexterity saving throws against Earth Tremors and the swallow portion of Bite. If they are able to swallow even two members of a four-person party, the wurm is going to begin dealing explosive amounts of damage. Let’s do some math. But that’s also a lot of assumptions. Which is why I state that wurms have a high damage potential and not a high damage output. Fighting a wurm is a war of attrition. The longer you take, the better the chances the wurm has to realize its damage potential. A creature with 50 ft. of speed alone already has some great mobility in combat. A creature with mixed movement also typically has some excellent advantages in combat due to their mobility as well. Wurms have both and then some. They boast a 50 ft. speed, but up to 30 ft. of that can be used for burrowing. This can not only make it easier for the wurm to position themselves, but they can burrow underground to give themselves some cover and additional survivability. You’re not outrunning a wurm. You need a strategy. Credit: WotC. They also have the Tunneler trait meaning that they can burrow through solid stone or other hard materials. Albeit, at a much slower pace, but still, having options is important. Mobility by far the biggest strength in the wurm’s kit. It gives them the ability to reposition, zoom into range to afflict enemies with Earth Tremors, and retreat underground if need be. If the wurm is surfaced and targetable by their enemies it’s not terribly difficult to deal damage to them. Sure, they have 18 AC and good-sized health pool, but that’s really all they have going for them. They don’t have any resistances or condition immunities and they have a +0 on Dexterity saving throws. If you can hit a wurm with the right spells you can make quick work of them. They’re also reliant on their enemies being in contact with the ground. If their targets aren’t then they cannot see them underground with their tremorsense. They also cannot deal any damage to them with Earth Tremors. They’ll have to surface in this case and make themselves vulnerable. Sure, the wurm has some great survivability when they’re underground and untargetable. However, to be effective, they’re not going to always have that luxury. When they don’t, they’re essentially enormous sitting ducks. Well-armored ducks, but ducks nonetheless. The vast majority of the wurm’s damage output is reliant on its enemies not being able to make the DC 20 Dexterity saving throws to avoid Earth Tremors damage and to avoid being swallowed. Sure, a DC 20 Dexterity saving throw is nothing to scoff at. But it’s not out of the realm of possibility for an adventuring party with a lot of dexterous members. Especially if they have a paladin nearby with Aura of Courage, though it’s probably not advised to tightly group-up against a wurm. The issue with these saving throws is that if the target passes the saving throw, nothing happens to them. They don’t take half damage or anything. While this is fair considering how devastating failing these saving throws can be, it makes the wurm a high-variance creature. With a bit of luck, the wurm is not nearly as terrifying an opponent as it should be. It should be painfully obvious that a wurm needs a plot of open space to be effective in combat. They’re at their best when they can use their movement speed to its potential. The party will instinctively spread out to avoid stacking up for Earth Tremors, and the wurm will then be able to pick them off one-by-one to avoid a lot of opportunity attacks. But, wurms are also Seige Monsters. They excel at demolishing buildings and can even do a ton of passive force damage to structures. Cities, towns, and villages are all full of structures and are therefore a big playground for a wurm. They’d also make for an interesting battleground. The wurm has enough space to play around and wreak havoc. The party then has to find a way to corral the beast and slay it while trying to minimize the damage it does to the city. Honestly, this is a win-win for encounter design! It’s an ideal battlemap for the wurm, but it’s also a dynamic and unique encounter for the party. While a city would make a cool encounter location, wurms are found in the wild too! Credit: WotC. You’re going to have to break a few eggs to make an omelet if you hope to be successful as a wurm. There are times where you’re going to have to surface and allow the party to make some attacks against you in order for you to deal some massive damage to them. Your survivability relies on being able to swallow a couple of your enemies up. This reduces the damage that they can do to you but still allows you to passively deal damage to them as you crowd control them. You may have to take some opportunity attacks to swallow a few enemies. I’d wager that this is frequently worth the risk. You have 18 AC so you’re not exactly easy to hit. Use this to your advantage and don’t be afraid to surface, Bite and enemy, and drag them down underground with you. Wurms aren’t intelligent creatures. They’re not going to be able to immediately pick-off a spellcaster or a squishy target. Instead, they’re going to be looking for who is hurting me the most and targetting them. Now you may be asking yourself, “what’s the difference between a wurm and a purple worm?” Honestly? Not a whole lot. Wurms are able to deal some AoE damage with Earth Tremors, but the purple worm is able to hit once with a stinger that can deal some massive damage. Wurms also have much more balanced ability scores which is beneficial for their survivability. I love the idea of a creature tunneling about the battlefield and swallowing their enemies. It creates an interesting dynamic in the fight. 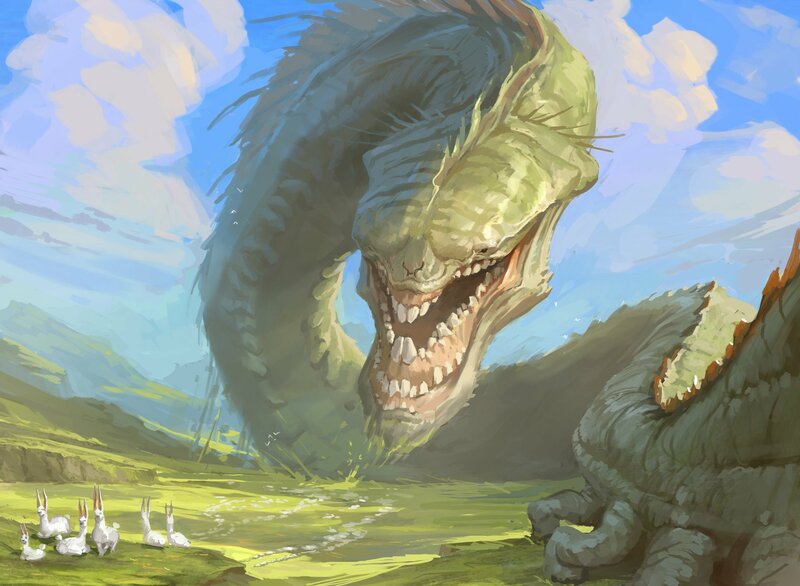 I’d totally use a wurm as a boss fight. In fact, I’d take a wurm over a purple worm any day of the week as a DM creating an encounter. The wurm feels like a much more devastating, but fair version of the purple worm. Sure, a purple worm can do a ton of burst damage with their stinger, but they do not have the consistent AoE damage and crowd control that a wurm can dish out to the entire party. Not only that but if you need a terrifying creature to lay siege to a town or city a wurm is your go-to creature as far as I’m concerned. They can dish-out constant, heavy damage to every building (and person) in a 30 ft radius as they burrow through the city.